The M-SET Club was started at Saratoga High School in 2010, but 649 was started 2001. In their first season, the the team and their robot, Progress, won the Silicon Valley Regional and advanced to the world championships. 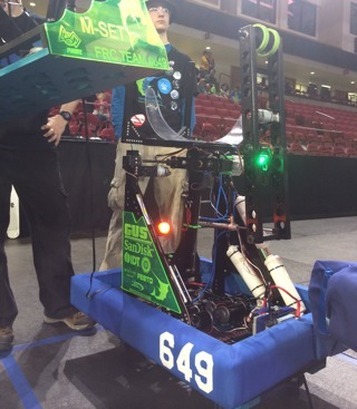 Since then, the team has competed in over ten regional competitions, and in 2015 they advanced to the world championships on a wild card from the Silicon Valley Regional. The team has gained various awards along the way, including an Imagery award in 2013, Innovation in Control award in 2015, Excellence in Engineering Award in 2016, Entrepreneurship Award in 2017, an Innovation in Control Award in 2018. In the current 2019 season, 'Sea Devil' was a regional finalist at the San Fransisco Regional and we won Engineering Inspiration at the Silicon Valley Regional. Every year, FIRST releases a challenge in early January to all FRC teams around the world. From that day, teams have six weeks to design, build, and program a robot to complete that year's challenge. This six week build season is followed by six weeks of competition which culminate at the FIRST world festival. This year (2019) the challenge is called Deep Space! Good luck to all teams participating in tournaments around the world!